If there’s a kid (or kid at heart!) 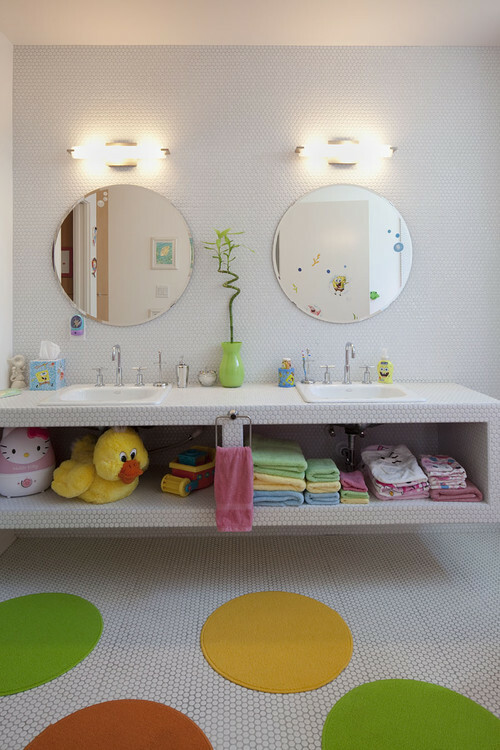 in your house who has his or her own bathroom, consider yourself lucky – decorating a kid-friendly bathroom can be loads of fun for you and the young user alike. 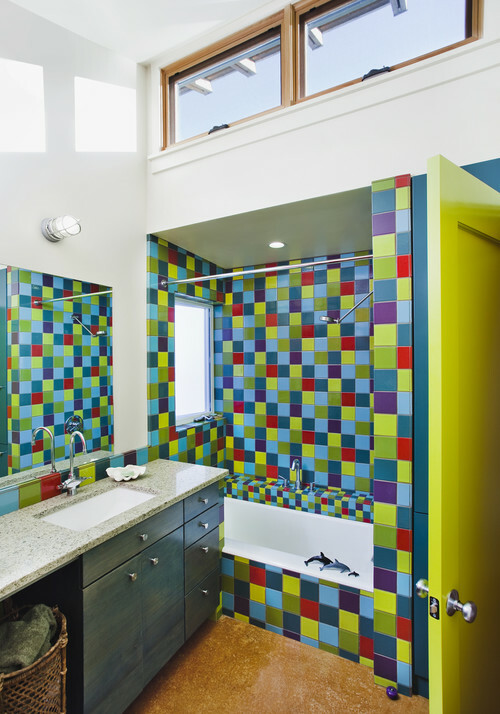 Kids’ bathrooms serve as a great place to go all-out with colorful, cute, and/or wacky fixtures. If you’re willing to go all-out kiddy, go for a fun vanity. Sonia’s Lesson 1 collection is designed to make bathrooms fun for all ages! Kids can actually draw on the wall-hung, dry-erase, magnetic vanity! The collection includes matching tumblers, towel rods, combination step stool/storage chest, trays, and a shatter-resistant safe glass mirror. If I was redesigning my kids’ bathroom now, you bet I’d pick this. So much fun. Now, if you have a houseful of girly-girls (or just one with her own bathroom), give your princess(es) a truly fairy-tale bathroom. It even has little fairies on it! Not exactly my speed, but I know plenty of little girls who would desperately want one. Once the little girl matures, she may want something more “sophisticated” – so go for a crisp butterfly print on a modern vanity for a bathroom that works from little girl to “grown-up” teen. I love the bright green door. If you don’t have the space, time, budget, or desire for a designated kiddie bathroom, have fun with temporary furnishings: shower curtains, mirrors, rugs, towels, accessories… the possibilities are practically endless, and easy to change as the kids (and their tastes!) grow. I think bright green may be a contender for my new favorite color! I love how this blah bathroom was rescued by simple accessorizing. Who wouldn’t smile in that room? LEGO ice cube tray + soap making supplies = LEGO soap! Do your kids have their own bathroom? What have you done with it? Please share it with us!